Important Update: Due to circumstances beyond the control of GBBC or Dr. Moritz relating to health concerns, the roster of speakers for this year’s Bible Conference has been changed. Dr. Bill Thompson, Prof. Ed Kuhar, and Mr. Roger Barnes will step in for the morning sessions, while Dr. Oats will speak as scheduled for both morning and evening. The GBBC Family is grateful for Dr. Moritz’s willingness to be a part of the Bible Conference, is praying for his speedy recovery, and is looking forward to his participation in future GBBC Events. Grace Baptist Bible College will be holding its annual Bible Conference in March 2017! Please mark your calendars! "Contrary to what people think, the people known as Baptists are not simply “another” denomination. 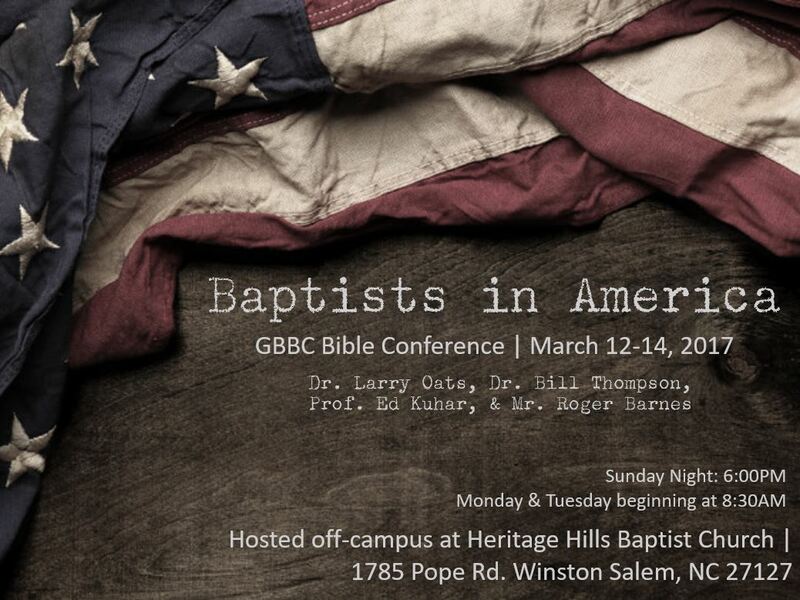 Believing that following a biblical model will produce a visibly recognizable Baptist church, GBBC’s Bible Conference aims to look at the biblical history and heritage of God’s institution for this dispensation. The rich heritage of modern Baptists, which begins in the 17th century, and rests on the principles established by God in the early days of the church, can serve to challenge and encourage Bible believers who are attentive to His Word and sensitive to His Spirit. Baptist principles have informed and impacted areas of life beyond the walls of the church as believers have sought to be salt and light in a dark and dying world. GBBC would like to invite you to join us for a time of warm fellowship around the Word, and reflection on our Baptist heritage, as we occupy until He comes."